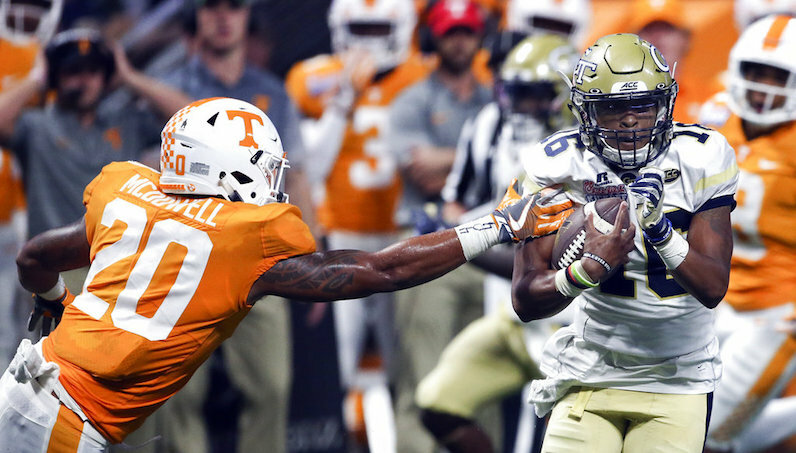 Even in defeat, Georgia Tech quarterback TaQuon Marshall — a converted running back — was one of the stars from week one of the college football season. This game, and Marshall’s productivity, certainly didn’t go unnoticed; ESPN announced on Tuesday that the double-overtime thriller drew the third-highest overnight rating (3.3 nationwide) for a regular season college football game in the last year. The Volunteers get credit for twice coming back from being 14 points down, and ultimately winning the game. However, the performance put forth by Marshall was superb, and completely deserving of praise. Let’s check the numbers — and record book. TaQuon Marshall became just the fourth ACC player since the 2000 season to carry the ball at least 40 times in one game. In fact, Marshall’s 44 carries are the most by one player in a game since that 2000 season. He’s also the only quarterback on that list; the other three players were all high-volume running backs — Ray Robinson of NC State, and Boston College’s Montel Harris and Andre Williams (#Andre2K). Georgia Tech turned the ball over twice against Tennessee; one of those turnovers was the result of a Marshall fumble. The quarterback wasn’t without a turnover; however, to carry the ball 40-plus times, and put it on the ground just once is rather impressive. According to JuliaKate Culpepper at the Atlanta Journal-Constitution, Marshall set single-game program records for rushing touchdowns (five) and carries — 44. Run, run, run…and maybe a pass, too? The 249 yards TaQuon Marshall accumulated on the ground against Tennessee is tied for the 15th-most rushing yards in an ACC game since the 2000 season, too. It’s also the most ever in game by an ACC quarterback. Over the last 18 seasons of football, including the 2017 campaign, he joins Lamar Jackson as the only other ACC quarterback to rush for at least 225 yards in a game. Dating back to the 2013 season, ACC teams have rushed for 249 or more yards on at least 44 carries 101 times. Georgia Tech — college football’s connoisseurs of the triple option — accounts for 37 of those instances (36.6 percent). Marshall, alone, hit those benchmarks on Monday night against Tennessee. He also completed 5-of-9 passes for 120 — including two to Ricky Jeune. It was just the 59th time since 2000 that a player has run for 200-plus yards and attempted at least five passes.